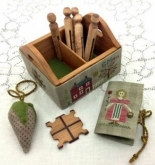 An Icelandic Christmas Sewing Set chart & fabric from Giulia Punti Antichi / GPA Designs ~ 1 only! 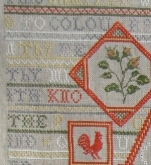 Ann Forfitt 1812 from Hands Across the Sea Samplers ~ Out of Print ~ 4 only! Autumn by the Sea from Jeannette Douglas Designs ~ 1 only! She Believed She Could from Lizzie Kate ~ Nashville 2017 ~ 1 only! Hannah's Sewing Tray from Giulia Punti Antichi ~ 1 only! 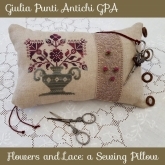 Flowers and Lace Sewing Pillow from Giulia Punti Antichi ~ 1 only! Sweet Summer ~ Limited Edition Kit from Lizzie Kate ~ 1 only! Carriage House on Main from Carriage House Samplings ~ 1 only! Clear Butterfly Magnet from Accoutrement Designs ~ 1 only! Spring Rose kit from the Examplarery / Joanne Harvey ~ 1 only! OCD Burl Box 6.5" x 8.25" opening for Jeannette Douglas Designs & others ~ 1 only! 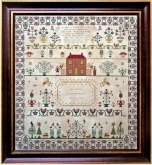 Square-Ology Paisley Frame from Just Another Button Company & Hands On Design ~ 1 only! Gingerbread Haunted House from the Victoria Sampler ~ 1 only! Luck ~ Celebrate with Charm Flip-It from Lizzie Kate ~ 1 only! Flowers 1 ~ Scissor Keep & Key Keep kit from Michael Powell ~ 1 only! Italian Diamonds ~ Bellpull from Wendy KC Designs ~ 1 only! This Land ~ Kit from Shepherd's Bush ~ 1 only! Old Glory Pin Set from Giulia Punti Antichi ~ 1 only!